Members of The Church of Jesus Christ of Latter-day Saints remember when Elder M. Russell Ballard of the Quorum of the Twelve Apostles delivered the commencement address for BYU-Hawaii in December, 2007. His address caused quite a stir in the online LDS world: he challenged and exhorted members to use the modern media to share the Gospel and talk about our beliefs and practices. He wanted us to engage the world using the new, modern media. What resulted was a flurry of activity–blogs, podcasts, commenters–that centered around our faith. Although the HTML version is not up yet, the PDF version is now up. Go here and select the July edition. Now, may I ask that you join the conversation by participating on the Internet to share the gospel and to explain in simple and clear terms the message of the Restoration. Most of you already know that is you have access to the Internet you can start a blog in minutes and begin sharing what you know to be true. You can download videos from Church and other appropriate sies, including newsroom.lds.org, and send them to your friends. You can write to media sites on the Internet that report on the Church and voice your views as to the accuracy of the reports. This, of course, requires that you understand the basic principles of the gospel. It is essential that you are able to offer a clear and correct witness of gospel truths. It is also important that you and the people to whom you testify understand that you do not speak for the Church as a whole. You speak as one member–but you testify of the truths you have come to know. Far too many people have a poor understanding of the Church because most of the information they hear about us is from news media reports that are often driven by controversies. To much attention to controversy has a negative impact on peoples’ perceptions of what The Church of Jesus Christ of Latter-day Saints really is. Elder M. Russell Ballard, “Sharing the Gospel Using the Internet,” Ensign, July 2008, p. 62 (italics in original). Do I have the right to write or say something that offends another person? America is quite unique in this regard. People are, generally, allowed to say and do what they want. This gives rise, inevitably, to racism, sexism, homophobia, xenophobia, and a host of other evils. And they are, essentially, protected by law. Most people in society recognize that these things are wrong and bad. They seek to educate people about what is true, right, and good. But some want to go further: they want to put an end to these evils by force of law. I belong to a number of minority groups that could make me a target of negative comments. But I don’t care. I believe it would be utterly wrong for someone to be punished because they said something offensive, even if it’s vile. They can say what they want to say: I can respond back if I choose to do so. One of the immense drawbacks of censorship is that it puts us on a slippery slope. What is considered unacceptable will widen, greatly stifling expression. Pretty soon, all dissent would be banned. We see this clearly on college campuses, where in the name of tolerance all contrary opinions (contrary to the politically-correct line espoused and promoted) are discouraged if not punished. There is no real freedom of thought, expression, or speech. When Ralph Reed attracts more condemnation and vitriol than Farrakhan, something has gone wrong. People on the Left are all for censorship, because they are the ones doing the censorship. The people on the Right are the ones who will loose. And so we must protect our freedoms and liberties, which are slowly being taken away from us in the name of tolerance, acceptance, and other PC values. One of the dangers of A Certain Past Republican Contender for the Nomination of Presidential Candidate, which to me was the worst of his offenses, was isolationism. I have noticed that a number of Latter-day Saints I know want to learn Arabic. And all of them are returned missionaries. I wonder if Heavenly Father is laying the foundation of a great and marvelous work to A Certain People. Although I believe that penetrating the Green Curtain will prove far more difficult that getting through the Iron Curtain. 1. Though I speak with the tongues of men and of angels, and have not charity, I am become [as] sounding brass, or a tinkling cymbal. 2. And though I have [the gift of] prophecy, and understand all mysteries, and all knowledge; and though I have all faith, so that I could remove mountains, and have not charity, I am nothing. 3. And though I bestow all my goods to feed [the poor], and though I give my body to be burned, and have not charity, it profiteth me nothing. 8. Charity never faileth: but whether [there be] prophecies, they shall fail; whether [there be] tongues, they shall cease; whether [there be] knowledge, it shall vanish away. 13. And now abideth faith, hope, charity, these three; but the greatest of these [is] charity. I find verse 3 to be the most interesting: even if we do the good thing but without true intent, it’s useless. The point these articles make is that Bush says that rising energy prices is bad for America, and to alleviate this we need to explore other options, such as offshore drilling. He is, as can be expected, opposed by the Left. But this typical of the Left. The Left complains incessantly about rising energy prices and places the blame squarely at the feet of Bush. But when alternatives are mentioned, alternatives which would help us lower energy prices, the Left goes into a tizzy, and the Left ends up opposing any practical solution for some reason or another. And they complain Bush isn’t doing anything when Bush can’t do anything, what with the Left striking down all practical solutions. So the Left paints a deceptive picture. But then, the Left contains philosophies, values, and paradigms that don’t really match reality. They skew the order of things that actually matter, placing soft and irrelevant issues (environmentalism, animal conservation, not inconveniencing animals, redistribution of wealth, and so on) higher than things that do matter or that should matter (such as lowering the cost of getting things done in the economy, promoting free enterprise, supporting business endeavors to enrich people, let people enjoy the fruits of their own efforts, and so on). And so while the Left wants to sacrifice everything of value to intangible things and issues (might I say, to false gods?) and make everyone equally miserable, the Right wants to help everyone advance themselves by themselves, to enable everyone to be happy, and to allow practical solutions that affect our livelihood. So the fault, really, lies not at Bush’s feet but at the feet of those hinder him from doing what should be done. All Hail Our Lord, Obama? I was going to hold off on going off on Obama but I am increasingly becoming irked if not extremely displeased. A few days ago, I saw a bumper sticker on a car that said “Got Hope?” I thought to my self, “Now that’s a clever Christian bumper sticker.” Slowly, though, from the car’s other bumper stickers, horror began to dawn on me. I felt the Spirit rushing away as I realized what the bumper sticker referred to. That was the last straw. How can a man be so successful whose campaign is practically a large parade of iniquity, false witness, falsehoods, and now blasphemy? I have heard Obama speak. As I mentioned to my father, his rhetoric reminds me of other rhetoricians, like Hitler and Stalin and Mussolini. All based on stirring emotions, to lead the proles forward in obeying the Glorious Word of the Leader. But does words have any substance? He’s nothing but sounding brass and tinkling cymbals. Change and hope. Hope and change. What about them? How will he implement them? It’s just words he uses to whip up a frenzy. Mindless, zombie-like frenzy. No one has become so enamored with and enthralled (in the latter case, a good word to describe this phenomenon) by Hillary Clinton or John Edwards or John Kerry or Mitt Romney or Rudy Giuliani or John McCain. We see this enthrallment to some degree among some Paulbots and fewer Huckabites, but nothing compared to the ridiculous adulation poured out on Obama. Honestly, it’s almost like they’re hailing a god incarnate. What is he, the Hidden Imam? Jesus Christ returned to Earth? Maitreya? All we need now is for some Jews to come out and proclaim him to be the Messiah. Der schwarze Moshiach, nu? We’ll probably discover he’s a Goa’uld System Lord. There are many black Americans who would make good presidential candidates, even if I may not agree with their politics. If Obama is the best we can do, we’re in serious trouble. As a person who studies religions, the almost religious frenzy and adulation towards Obama is very, very concerning. I can see it very well. I’m surprised that others haven’t caught on. This is a matter of grave spiritual and national concern. As election times comes closer, you will see this blog become more political. Once the lines are drawn, I want people to be more aware of what’s at stake. I want to put this race in greater context. But Iran doesn’t have to launch a missile. All it has to do is give a nuke to Hezbollah, who is across the border from Israel. Ever heard of a dirty bomb? Iran could be the first one to use it, through Hezbollah. This will be a small and simple post. I never really liked music that was mainly (if not solely) piano, but Tolk changed that for me. I got a CD of his almost a decade ago (but lost it later) and I always remembered it fondly. (I went and electronically downloaded all of his albums today. Each one is awesome.) He’s classified, for some reason, as “New Age”, but his music is not what I associate with New Age. It is true that his music doesn’t fit any of the usual genres (except for a number of hymns he arranged and plays). It’s all very calming, and somehow perfect. Some are slower, some are faster, most go at a steady, medium pace. Here is David Tolk‘s website. Do your ears and soul a favor and listen to a few of his songs, if not buying a few albums. 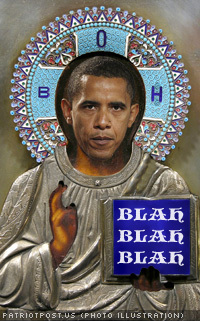 Caption: Is Barack really the Messiah? From Patriot Post‘s “08-23 Digest”. Here at National Review Online. Nice Deb covered this situation in her post “Petition to Defrock Pfather Pfreaky”. News from “Update: Michael Pfleger removed from his position at St. Sabina Catholic Church.” by Defending. Contending. To put recent events in some perspective, I have asked Father Michael Pfleger, Pastor of St. Sabina’s Parish, to step back from his obligations there and take leave for a couple of weeks from his pastoral duties, effective today. Fr. Pfleger does not believe this to be the right step at this time. While respecting his disagreement, I have nevertheless asked him to use this opportunity to reflect on his recent statements and actions in the light of the Church’s regulations for all Catholic priests. I hope that this period will also be a time away from the public spotlight and for rest and attention to family concerns. I hope also that the life of St. Sabina’s parish may continue in uninterrupted fashion. Fr. William Vanecko, Pastor of St. Kilian’s parish, will be temporary administrator of St. Sabina’s and will assure the full complement of ministerial services during this period. I ask the members of St. Sabina’s parish to cooperate with him and to keep him and Fr. Pfleger in their prayers. They are in mine. More understanding = fewer freedoms? It is one of my biggest frustrations that, as man is supposedly becoming more sophisticated in understanding himself and his societies, we end up with fewer and fewer freedoms, rather than more. That sort of regression is not only nonsensical, but dangerous. As S. Weasel informs us in her post “Free Mark Steyn! (Relatively inexpensive Mark Steyn, anyhow)” Today starts the trial of Mark Steyn for offending Muslims. He did this by publishing a book, America Alone. The suit also is against the Canadian magazine Maclean’s for publishing an excerpt of the book and for not allowing Islamists to hijack the magazine to refute the article. They want Steyn silenced. And they may win. And I will be heartbroken. But I will have hope because Steyn is an American citizen, and he can’t be silenced here. But the Islamists’ victory in Canada will bode very ill for all of us. The Muslim world has youth, numbers and global ambitions. The West is growing old and enfeebled, and lacks the will to rebuff those who would supplant it. It’s the end of the world as we’ve known it. An excerpt from ‘America Alone’.